Finding Ways to Water $17.95 Collected Poems from Harold's days in the San Francisco Renaissance to today: 208 pages. 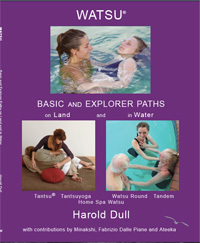 Bodywork Tantra $19.95 Harold'd first book to introduce Watsu and Tantsu. 1987... Collector's item. Watsu 2... A complete Watsu 2 session in real time and adaptations for size and inflexibility. TThe complete estblished form of Watsu. The cost of 1 DVD is $30. If more than 1 is ordered the costs are for 2: $55, for 3: $80, for 4: $100, for each DVD added to the 4, $20. Items are sent by U.S. Priority Mail. The postage fee for North America is $7.00. Elsewhere it is $15. An 8.25% sales tax will be added to items mailed to a California address. I wish to donate $ to the fund for promoting Watsu and making its benefits accessible to everybody. If you are adding a payment for items previously invoiced or for a pre-arranged order or you have obtained from our office a special fee for shipping or for a class, or for other applications on the registry, enter the amount below. Detail in the memo at the bottom. The data below should be that associated with the credit card. Watsu Publishing (Store) is managed by Pavana Dull. Enquiries can be emailed to pavana@watsu.com.